I found myself caught up in a Twitterstorm yesterday. It started out innocently enough. Someone posted an enthusiastic response to a book read stating that it should be required reading. I posted immediately not because of this one post but because I am alarmed when I see someone's enthusiasm for a book immediately become an assertion that everyone should read the book. I should know better. Before the evening was over, the discussion swung from my statement to a heated discussion about whole class novels. Some of the people posting told me I should read more professional books including Donalyn Miller's books. (Note: I did reply that I was familiar with her work and had even written the foreword for RITW and was working on a book with her right now). I tried to turn the focus back on the initial tweet, but this issue had taken on a life of its own. Since I did not know all of the folks tweeting, I did a "background check." A few of those most adamant about #whole class novels were authors of novel units and worksheets. Of course, I thought, I had tread upon some sensitive toes. So, let me go ahead and do more than tread carefully. Worksheets never have and never will create a love of reading. No one ever finishes a book longing for a novel unit of activities in order to feel as though she really had read and absorbed the book. I sat Saturday entranced by UNCANNY by David McInnis Gill, a book coming in September from Greenwillow. As I completed the final pages, my fingers did not itch for a shoe box so I could create a diorama. I did not feel compelled to do vocabulary sentences, to answer literal comprehension questions, or to write any sort of essay. Instead, I posted my admiration for the book online. I do this often. I will post about a book in a few words. I will from time to time call something a "must read." I do not mean it is required, though. It is a book I felt a lot of my social network will find as compelling as I do. Now, in the interest of complete honesty, I have written guides for quite a few books. I have done guides for GNs and guides for individual titles. I try to make these guides flexible so that educators can take a few questions or 1-2 activities and personalize them for their classroom. I always recall the 42 page guide I saw for Make Way for Ducklings some years ago. The book itself is only 32 pages. So, short is good. Questions tend to be more than regurgitation and recall. Activities are not too prescribed. I compare that to some of the tortured packets I had to complete for #wholeclassnovel studies. To this day, I detest so many of the novels I was forced to read in school. There are swaths of titles and authors that I avoid because I spent countless hours doing word searches (did a word search ever move a less than enthusiastic reader to the avid reader category?) and vocabulary definitions (completely ignoring context clues, etc. ), and doing some sort of project which only tangentially related to the novel at hand. Let me be clear: no unit of study ever made me love a book I did not already love. Analyzing it, dissecting it did not make it a better book in my opinion. In many cases it cemented a hatred of a particular book or author. And I wonder how many others feel the same way? So, love a book. But don't let your enthusiasm extend to the "this should be required reading" impulse. Love the book. Promote the book (authors love that, too). Booktalk the book. Make the book accessible for other readers. You eloquently explain the dilemma with enthusiasm. 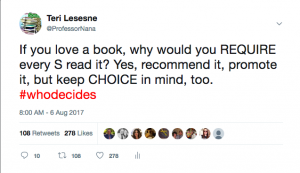 I hope your post(s) help some to rethink why they believe a novel must be required reading and reconsider how they bring that novel to life in their classroom. I had no idea this came next. Ack. But I guess it's to be expected these days. I love this post! I agree 100% that thoughtful book discussion guides can be amazing, but only when they offer questions that inspire discussion--not just about the book but about how it relates to life and history and politics and any number of things students are interested in, as well as how themes connect to other works they've read. But having to fill in the blanks on a worksheet to "prove" you read something, not so much. I hope your post and this one too, inspire more discussion about what's helpful. Thanks!